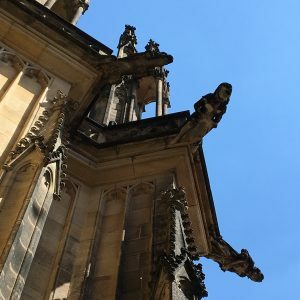 As part of my husband’s and my honeymoon trip to Prague, we intended to check off a modest bucket list item, which was to see the extant 14th century houppelande on display in Prague Castle. I also arranged to meet in person for the first time an on-line friend, Petr Voda, who is deeply involved in medieval re-enactment in the Czech Republic. 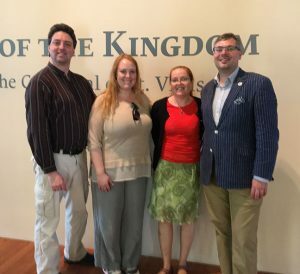 Petr is a devoted researcher and writer on the topic of historical clothing, and so it was a marvelous opportunity to spend time with a kindred spirit in a country steeped in a cultural history that is particularly abundant in 14th century lore. Petr Voda and Vlad’ka Vodava dressed in early 14th century finery. He met Greg and I on the street leading to the Charles Bridge after we’d been in Prague a few days. We then took the on-foot trek up the hill to Prague Castle, which consists of a compound of buildings including St. Vitus Cathedral. It’s a steep walk, guaranteed to get your blood flowing. St. Vitus Cathedral is a dramatic building! 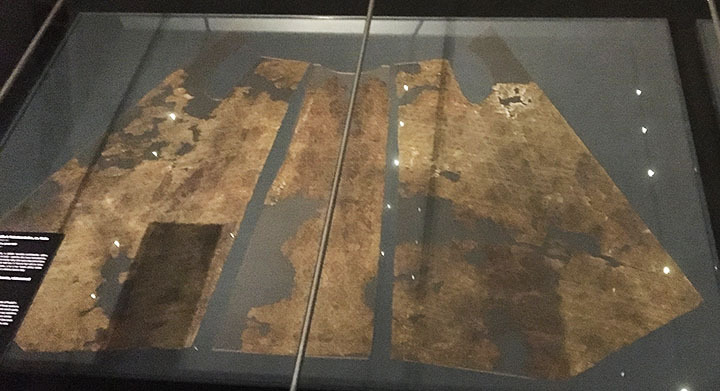 We made our way through the Story of Prague exhibit, which has a fair number of interesting textile fragments and clothing items, including the grave clothes of Rudolf I of Habsburg, who was king of Germany from 1273–1291. He had some control of Bohemia, while the widow of his former rival retained control of the territory around and in Prague. There is more to the story of the clothes themselves, but I leave this to my colleague Petr to tell in his own time, as the information is his. In particular I wanted to see the surviving houppelande of John of Görlitz (Jan Zhořelecký), which I knew very little about. 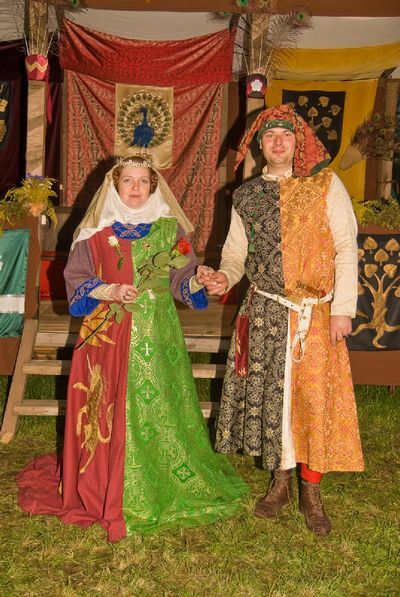 For those who are newer to the medieval clothing game, “houppelande” is a French term for a voluminous, long gown style worn by both women and men in the 14th and 15th centuries. 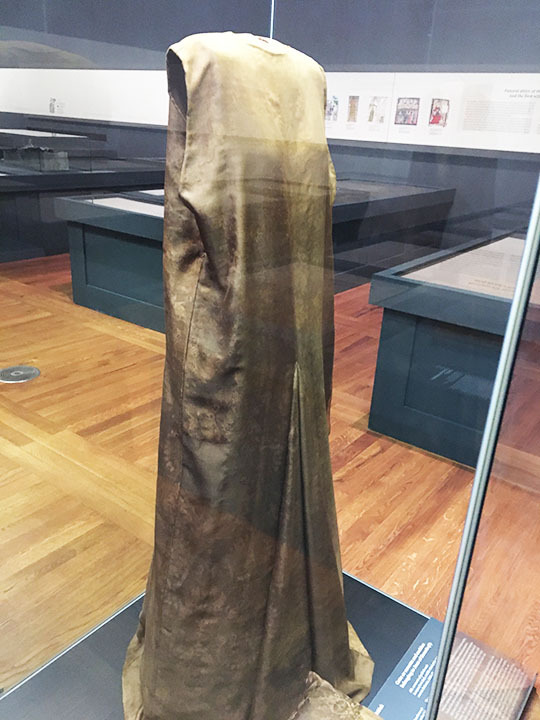 To my chagrin, we found that this gown had been moved from the “Story of Prague” to a temporary exhibit in another location. This was due to the 700 year anniversary celebration of Charles IV’s birth in 1316—the city was overflowing with special exhibits in celebration. In fact, I tried really hard to publish this blog post on the anniversary of Charles’ coronation in 1347, September 2nd, but missed it by a few days. It turned out that the houppelande was on our itinerary for the next morning. 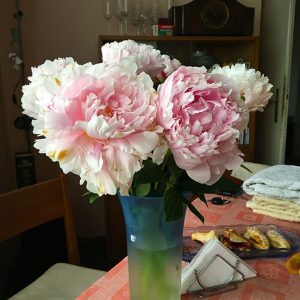 Petr had kindly made an arrangement to meet Dr. Milena Bravermanová, the textile curator of Prague Castle, at the exhibit containing the houppelande. She would be giving us a personal tour of the textiles there. In the meantime, we retired back to Petr’s home near the Polish border and had a lovely evening with he and his wife, Vlad’ka. Petr showed us his copious research on extant medieval clothing. I think that his scientific approach to data gathering would be valuable to the historical clothing world outside of the Czech Republic and I hope to see more of it soon. Vlad’ka is a great cook, and an impressive gardener. 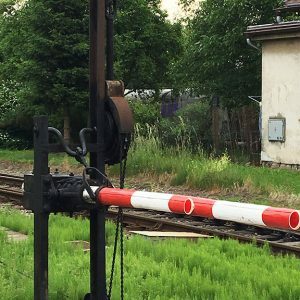 A hand-cranked railroad crossing gate near Petr and Vlad’ka’s home. I had no idea such things were still in use. The chain travels down the track some distance to a building where someone is on duty to crank the gate up and down. The next morning we all set out for Prague again. I was surprised by how early the sun rises in that part of the world in early June. I think the sky was bright before 5 AM. We made our way to the Crown of the Kingdom exhibit, which is on display in the Prague Castle Riding School until September 28th. This was the temporary home of the houppelande. 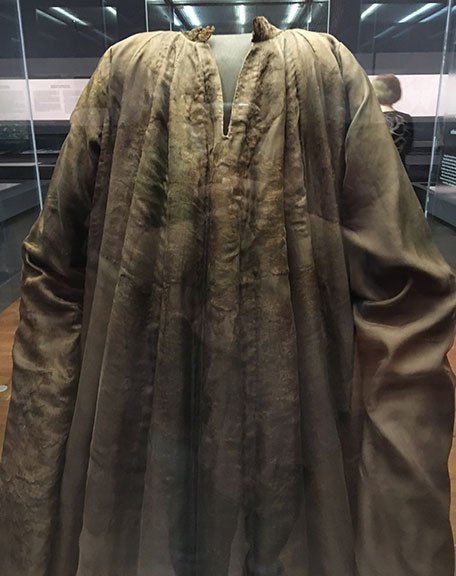 This exhibit did not just have the houppelande… it had many clothing fragments from several royal tombs related to Charles IV’s reign. This was a bonanza of 14th century clothing! The last room in the exhibit hall was devoted to the textiles which have been extracted from the royal crypt and studied. The story behind the grave clothes of the family of Charles IV is frustrating in the extreme. To sum it up, the tombs were disturbed and re-organized many times in the intervening centuries. By the time a concerted study was mounted in 1928, the tombs were in a deplorable condition. Much of the surviving clothing has deteriorated into scraps. Equally sad is the fact that it’s no longer possible to know beyond an educated guess whose clothes are whose in some cases. Charles’ four wives’ bodies were all piled into a single coffin, for instance. 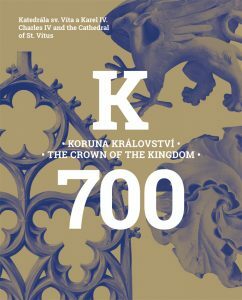 For a more thorough treatment of this story, I recommend the exhibit catalog, The Crown of the Kingdom, which is available in English. Some of the details that follow are summarized from the catalog text, while other observations are my own. I’ve attempted to differentiate with endnotes. 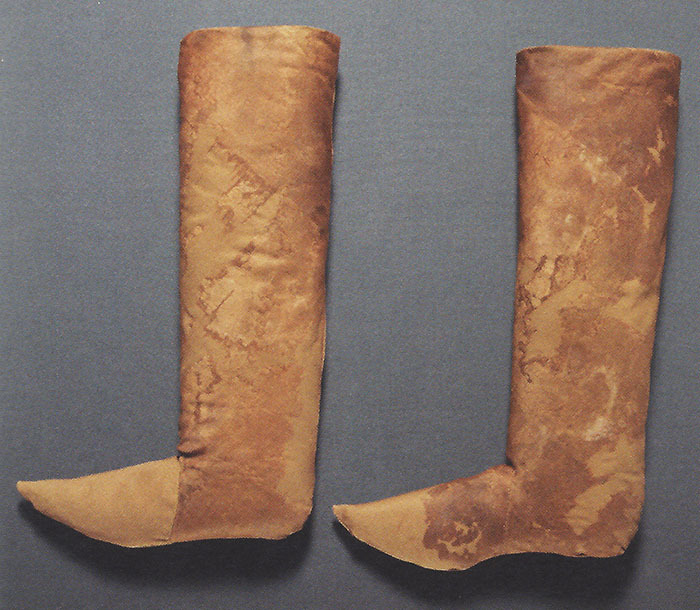 Sleeveless surcotte presumed to be Joan of Bavaria’s. Note the fabric-conserving gore arrangement, where two right-angle triangles together form an isosceles triangle. 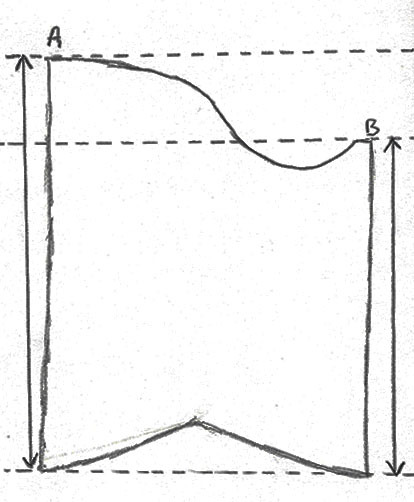 This technique is used so that a rectangle of fabric can be used to create the gore, rather than a triangle. Also note, the gore is inserted into a slit, a common (but sometimes fiddly) tailoring technique in this time period. I have a tutorial for doing this here. 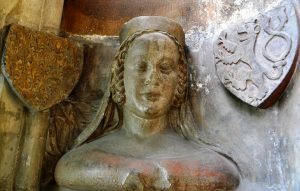 Bust of Joan of Bavaria in St. Vitus Cathedral; the round structure on her head is not a hat; the sculptor created that plain cylindrical form so that a crown could be placed on it. Originally, such busts were painted in full color, and elaborate crowns adorned the heads of royals. Thanks goes to Petr for this fascinating tidbit about crowns on sculptures. Photo from the exhibit catalog. Some of the clothing was obviously worn by the person in life, as more care had been put into its cut and make. 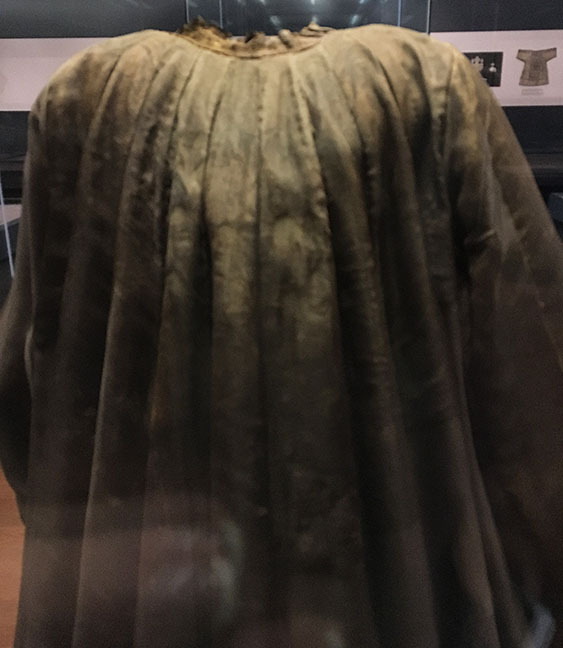 For instance, fragments of the bodice and skirt of a dress ascribed to Blanche of Valois, the first wife of Charles IV who died in 1348, show that the front closure’s small buttons were made of fabric, with shanks created from the thread used to attach the buttons to the garment. Bodice fragment presumed to belong to Blanche of Valois; note the buttons sewn to the edge itself. Photo from the exhibit catalog. 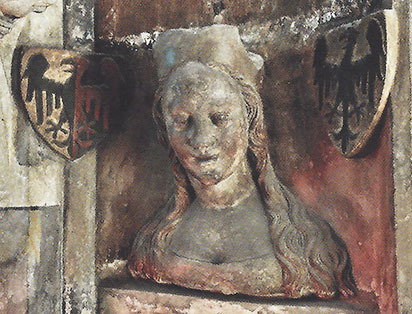 Bust of Blanche of Valois in St. Vitus Cathedral. Note: remains of red paint can be seen on the bodice of her dress. Photo from the exhibit catalog. 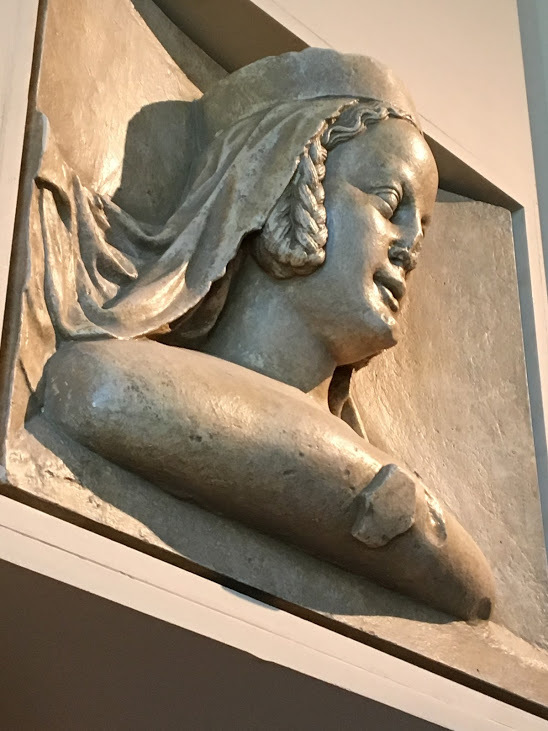 Bust of Blanche of Valois from the side; this is a casting from the original, on display at the Crown of the Kingdom exhibit. Note her braids do not appear as loops (a common costumer mistake) but rather as straight braids bent sharply back. Based on other sculptural and artistic examples, the braids probably bend horizontally about half way back up the length of the braid in front and meet at the back of her head. 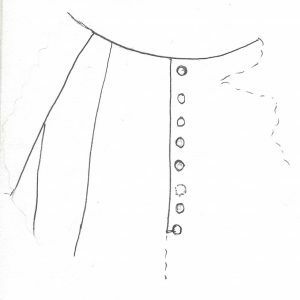 My drawing of Blanche’s bodice fragment. There’s not enough left to know what style of sleeve tailoring was used. The front portion of the bodice had no less than six panels, and as many as two gores set as high as the chest. 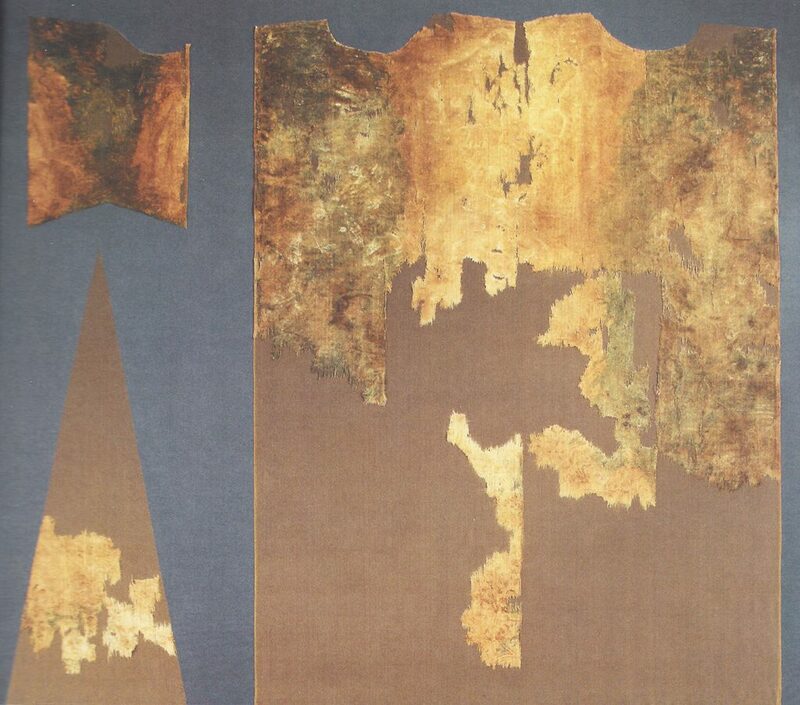 Possible cloak fragments attributed to Blanche of Valois. Note the vertical lines at the top; these are evidence of previous pleating. Photo from the exhibit catalog. Open, front-closing cloak worn by St. John the Evangelist in a fragment of the Roudnice Polyptych, painted in 1343 at the Augustinian monastery at Roudnice nad Labem. A brooch would have been used to close this style of cloak. The cloak is purposefully left hanging open, even though the tell-tale pointed edges where a brooch would attach the two sides together are visible. This may signify the subject’s modesty, or perhaps his preoccupation with piety, leaving less concern for neat appearance. 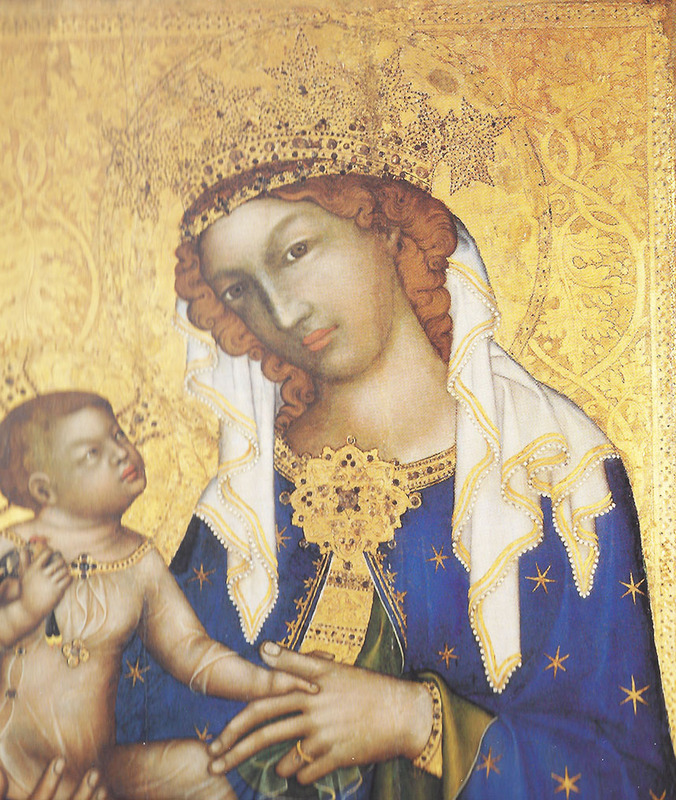 The Virgin and Child of Zbraslav, painted in Prague and donated to the Zbraslav Abbey Church by Charles IV between 1345 and 1350. Note the decorative band around the neckline and the brooch used to close the cloak. 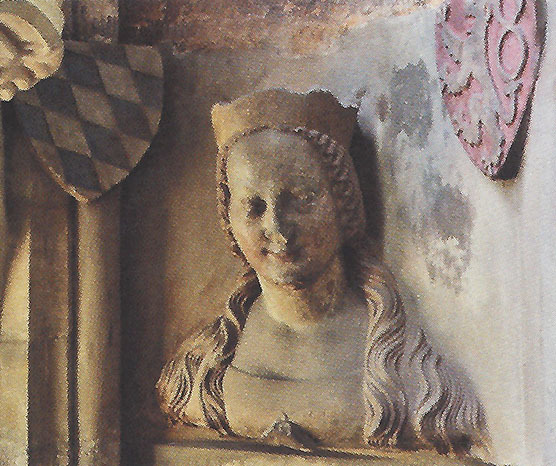 Bust of Anne of Schweitnitz, who died in 1362. The dress is probably a rapidly-made funerary surcotte, due to its extremely simplistic tailoring. What’s most interesting is the surviving sleeve cap, showing a rather atypical s-curve design. Anne von Schweidnitz’s green funerary surcotte. 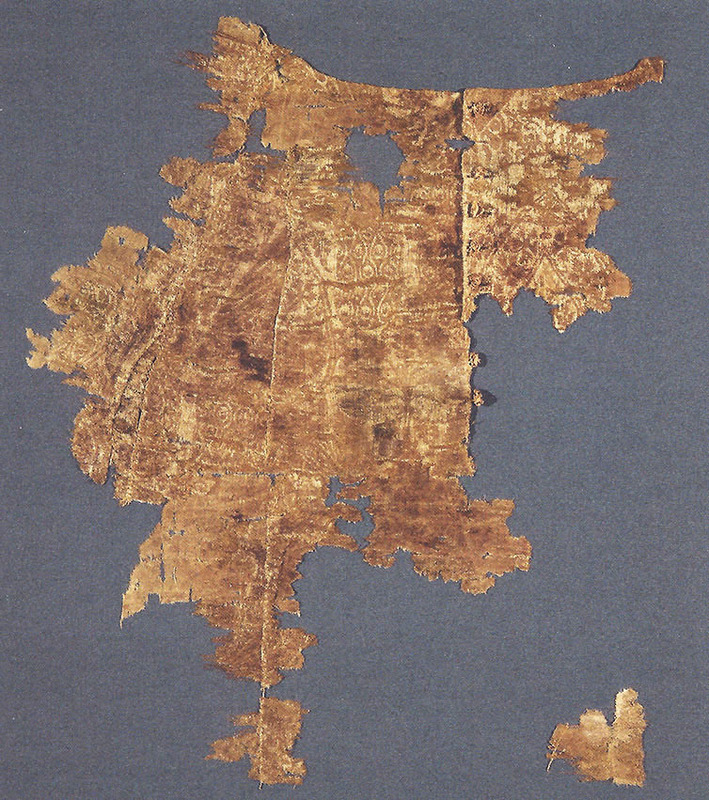 Note how the body of the garment was cut in one giant rectangle, a sure way to know this was done hastily for burial. Photo from the exhibit catalog. Cutting the sleeve cap in an s-curve allows the seam to run down the back of the arm, which comes in handy for creating shapes into which the elbow can bend, as well as placing buttons in the perfect outward-facing position on the forearm. It’s not as useful for short sleeves with no extension past the elbow. What makes this example atypical is the differing heights at the two ends of the sleeve cap. For an s-curve sleeve cap to work, the ends must be the same height. Otherwise, the the long seam edges will not match up. Since the sleeve cap appears to be fragmentary at the top, it’s possible that some of it is missing. 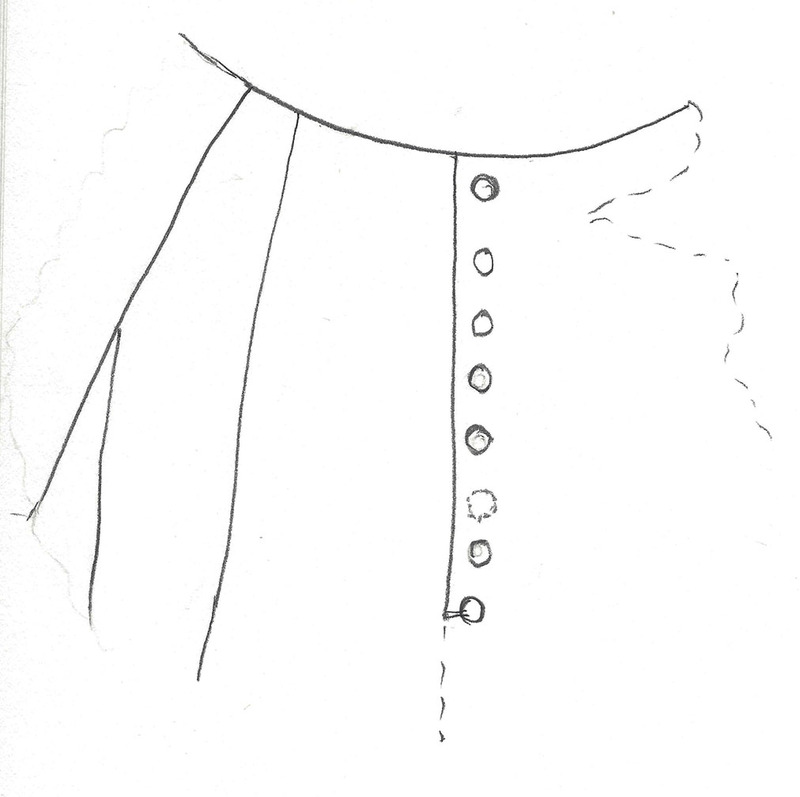 Diagram of green sleeve of Anne of the Palatinate. 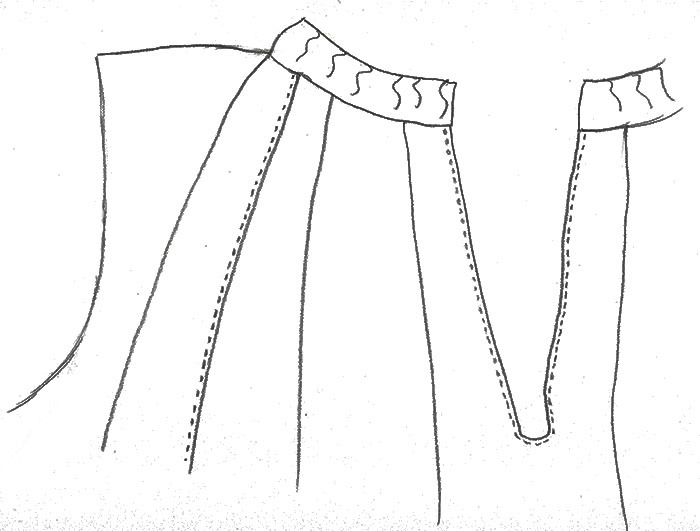 Note that the seam lengths are vastly different on each side of the sleeve. 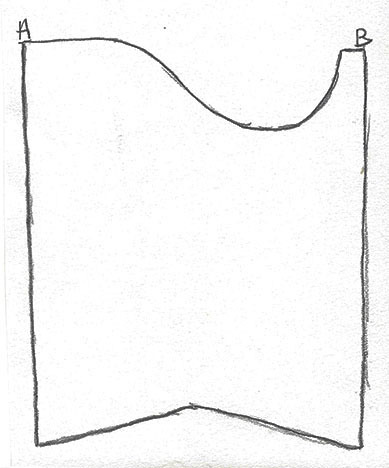 Diagram of how the exhibited sleeve would sew together. The long seam twists and the cuffs of the sleeve don’t come together at all. Diagram of how the sleeve might have originally looked. In this case, the two ends, A and B, are the same height. 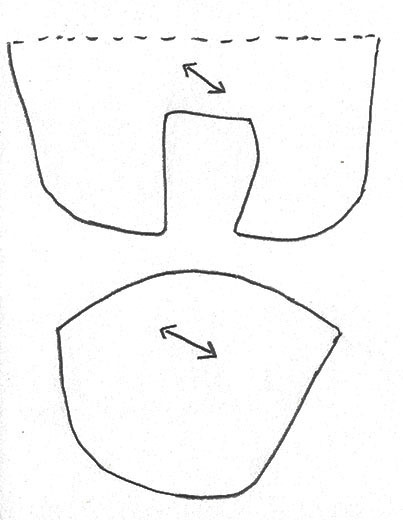 Diagram of how a proper sleeve cap would sew together. Note the ends form an attractive V that points off the elbow. 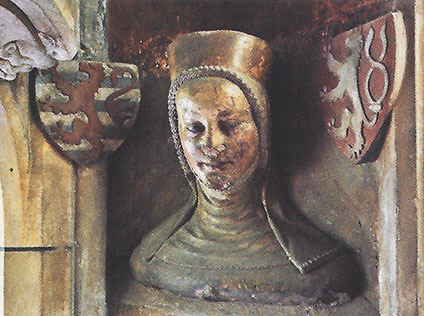 There is also a dress (in fragments) believed to have originally been red, and perhaps belonging to Anne of the Palatinate, Charles IV’s 2nd wife. I find it of special interest because of its surviving sleeve piece. 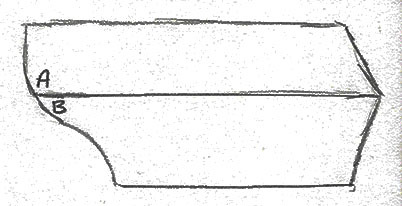 Based on its concave sleeve cap, it clearly represents the underside of a sleeve (the part that would lay against the body, ending at the armpit). The missing half would undoubtedly have a convex curve to complete the sleeve cap. 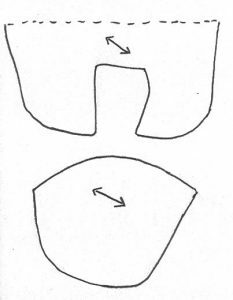 If they were sewn together side-by-side, they would form a typical s-curve sleeve cap. In the case of this sleeve, one seam runs down the back of the upper arm while the other runs down the front of the upper arm. 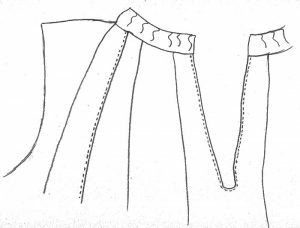 (9) Dr. Bravermanová has made the conclusion that the sleeve may have been cut this way to accommodate an integral tippet. (10) Indeed, this cut simplifies the tailoring for such a sleeve, and the tippet would hang perfectly off the end of the sleeve from this angle. I would probably tweak the speculative shape of the second half of the sleeve to make the convex portion of the sleeve cap larger to match the width of the concave portion. 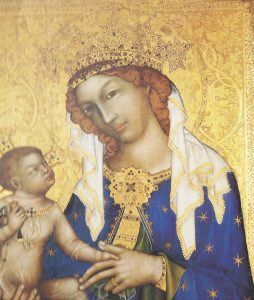 If indeed a tippet had existed, its shape would be narrower and its edges would remain parallel to each other, in the fashion of tippets seen in art in the early 1350s throughout Europe, at the time when Anne died (1353). Bottom half of a short sleeve attributed to Anne of the Palatinate. Note the missing chunk in the upper left corner. If the angle is followed, the concave portion of the sleeve cap continues on past its currently mangled end. Photo from the exhibit catalog. Redrawing I did from a drawing in Textiles and Clothing: 1150-1450 by Elisabeth Crowfoot, Frances Pritchard, and Kay Staniland. These are some shapes of late 14th century fragments of hosen found in London. 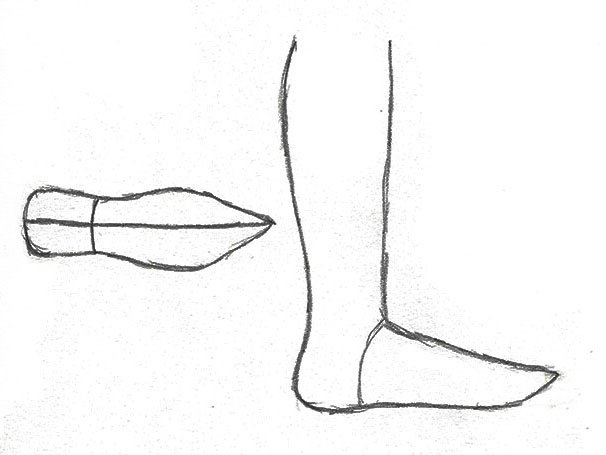 The top shape is the portion that encircles the ankle and heel. 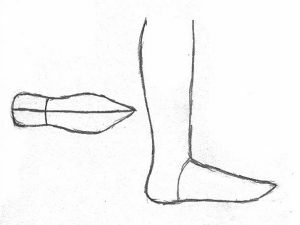 The bottom shape covers the rest of the foot. My drawing of what hosen made from pieces shaped like the ones above looks like. Tall slippers believed to be Charles IV’s. Photo from the exhibit catalog. You can see the cross-shaped seams on the bottom of the foot. Sorry for the blurry photo. I took it in a hurry. Other items of interest in the royal crypt collection include fragments of two kruselers. (For information on Kruselers, see Isis Sturtewagen’s article A Frilled Veil; The Headwear of Catherine de Beauchamp. 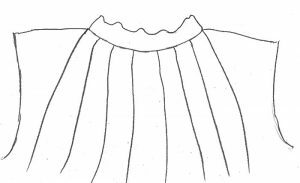 Isis also has other papers: Frilled & Pleated Headwear in North-West Europe (1350-1400) and De-/Re-Constructing Frilled and Pleated Headwear which are not published in print or online that I know of, and Unveiling Social Fashion Patterns, A Case Study of Frilled Veils in the Low Countries (1200-1500) which is published in Medieval Clothing & Textiles 7 (2011). For a more general set of resources including visual examples, see Larsdatter.com’s Frilled Veils page. 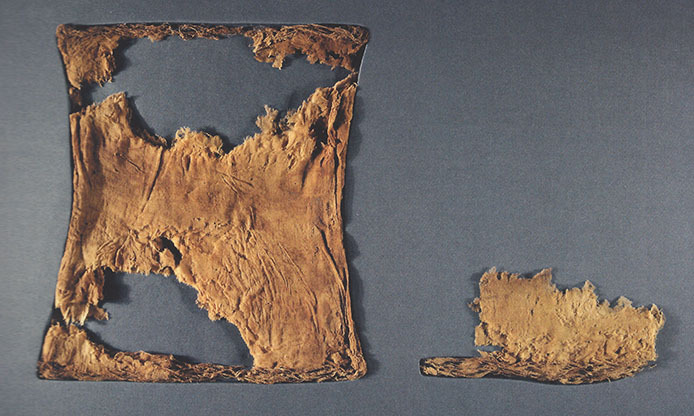 The larger and more historically significant of the two kruseler fragments in the Crown of the Kingdom exhibit is made of gossamer-thin silk crepe that has been folded over sixteen times. This piece is 275.6 inches long (700 cm) and almost 19 inches wide (48 cm), according to the informational plaque. 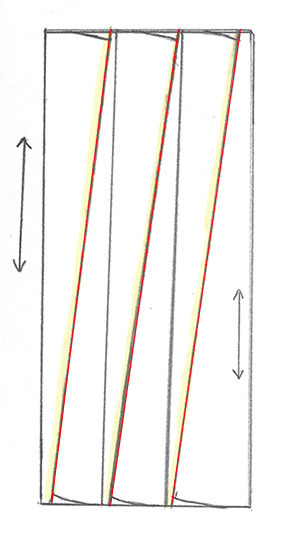 The frilled edge was created using doubled warp threads with a weaker twist than the internal warp threads have. Once the fabric was removed from the loom, the loss of tension allowed the material to become decoratively wavy. The layers are placed so that each one is slightly recessed from the next one, to enhance the visual effect. 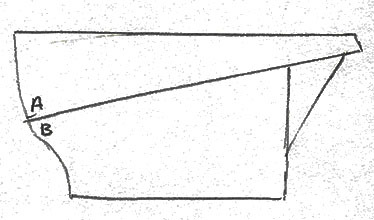 It’s impossible to know whether the current arrangement of folds is original, or if it was refolded at some point in the past after the tomb was opened. (12) I do wonder if the weave is crepe-like in order to encourage the layers to stick to each other. A smoother weave would be more likely to slide around. The layers don’t appear to be sewn to each other. Kruseler fragments. Photo from the exhibit catalog. There are multitudes of busts which adorn St. Vitus’ Cathedral, and only one of the royal women who appear among them wears a veil with kruseler characteristics — Elizabeth of Bohemia, or Elizabeth Premyslid, the mother of Charles IV, who died in 1330. She is portrayed with a low-profile kruseler-style veil and wimple. 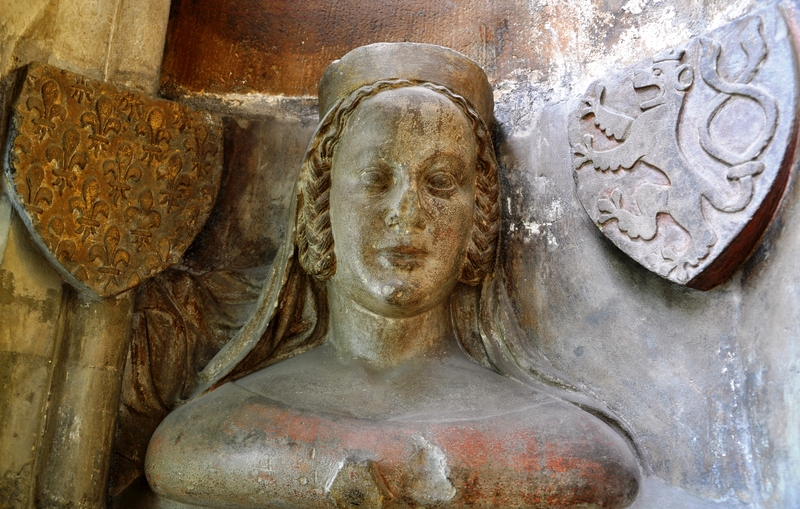 It’s unlikely she wore this in life, as the bust was carved much later, around 1375. The sculptor probably used a modest contemporary version of the style to portray Elizabeth in the most respectable light. Bust of Elizabeth Premyslid. One last reminder… not a cap. That’s a structure for placing a crown. Note, the wimple is also edged with a frill at both jawline and across her chest. 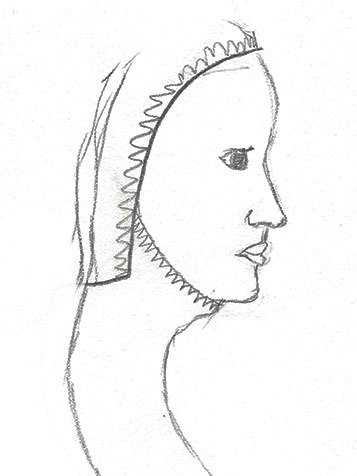 My sketch of Elizabeth’s kruseler veil shape from the side. Note the part that frames her face sticks out slightly from the portion that covers the rest of her head. This appears to me like a nod toward the shape of a front-opening hood. 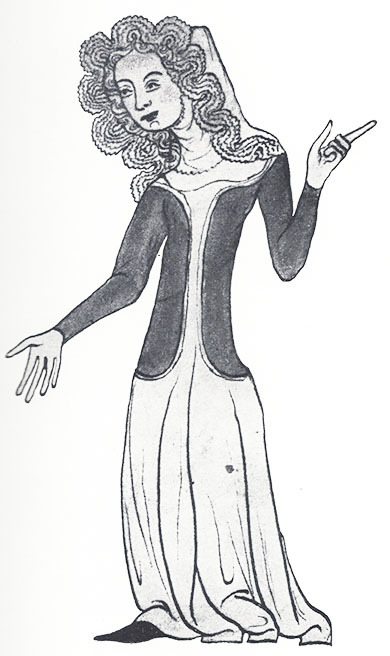 A highly fashionable lady from the late 1340s in the Velislav Bible, which dates from 1325 to 1349. Another fashionable lady in a different version of a kruseler from the Velislav Bible, folio 12a. And now finally, let’s talk about the houppelande. 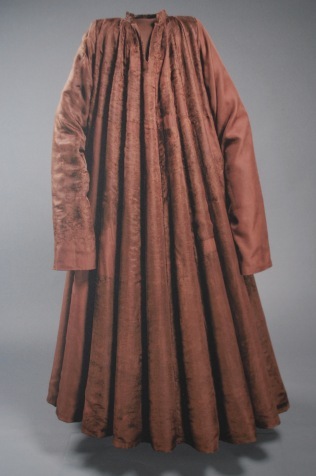 If you are fascinated by medieval European fashion, you have likely seen the sparse photos of John of Görlitz’s houppelande, which many of us in the Western hemisphere first found on the site Kostym.cz, a Czech resource for extant medieval clothing examples. It’s the only extant houppelande that I know of. For a concise summary of the garment know as a houppelande, see Rosalie Gilbert’s page on the topic. The picture of the houppelande most of us have seen. See how long those sleeves are? Odd. The back of the houppelande. This picture seems to be in less circulation than the front-facing one. John of Görlitz was the son of Charles IV and his fourth wife, Elizabeth of Pomerania. He was born in 1370 and died abruptly at the age of 25, in 1396. He was living in a monastery in Neuzelle, which sits on the modern-day German border with Poland. He apparently retired there after having fallen out of favor with his half-brother, King Wenceslas IV. Accounts state that he went to bed healthy one night and died in his sleep. Some believe he was poisoned, (14) but it is also possible that he may have had a sudden medical event that caused his death. I don’t know how many people know this, but the latest conservation report written by Dr. Milena Bravermanová in 2005 has been translated to English and is available online here. The referring page is The Brazen Burgundian. I found this only after I had met Dr. Bravermanová and received a copy of the original report in Czech from my friend Petr. 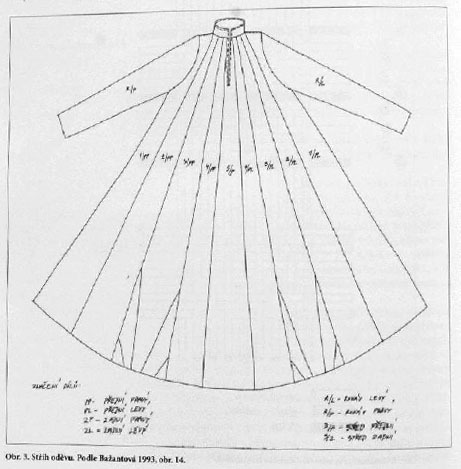 There is a seamed diagram of the garment (front view only) in the report, which is a fantastic resource for better understanding the tailoring used to make voluminous gowns around the turn of the 15th century in Europe. Seamed diagram from 1993 by N. Bažantová, published in Dr. Bravermanová’s 2005 conservation report. Placing multiple trapezoidal panels together while retaining a set-in armhole shape on the panels that encase the sleeve is ingenious. This is achieved by attaching all the trapezoidal panels to the neckline, leaving the shoulder seams to the four panels that have armholes cut into them. This makes the shoulder seams themselves smooth and simple, and bunches the fullness toward the center of the chest and back. This is less obvious on the garment itself, however, because the supporting form underneath it is built with extra bulk in the chest and upper back area in order to better distribute the fullness of the fabric. The front is made from nine panels, as is the back. There is a center panel, and then an equal number of panels working their way out to the side seam from there. 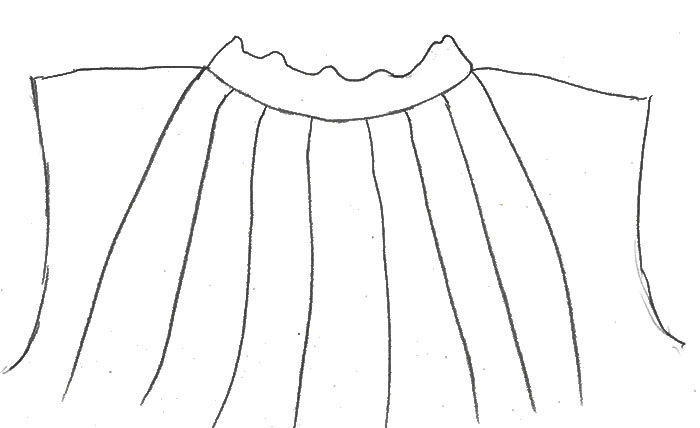 My sketch of how the seams appear at the top of the garment. The standing collar is no longer crisp. The front opening was probably closed by a brooch. My sketch of the seams as seen from the back. The strange piecing drawn at the bottom of the front panels in the seam diagram is mystifying, though. While it is possible the original maker did this for decorative reasons, I would be more inclined to see it from a fabric conservation point-of-view, since the garment was assembled in haste due to the unexpected demise of its wearer. And yet, I’ve not yet been able to puzzle out how those particular angles and cuts would ever be necessary when working with rectangular cloth. One of my own photos of the houppelande. As you can see, the glass thwarted clarity with its pesky reflective properties. My photo of the upper back. You can see how the form was purposefully bulked at the top to help spread the panels a bit more generously than they would have hung in real life. How the maker laid out the panels to be cut from rectangular fabric. Note that each panel has one straight grain side and one slightly bias-angled side (in red). I would bet money that if the maker was experienced, he sewed the panels together so that a bias side always met a straight-grain side. 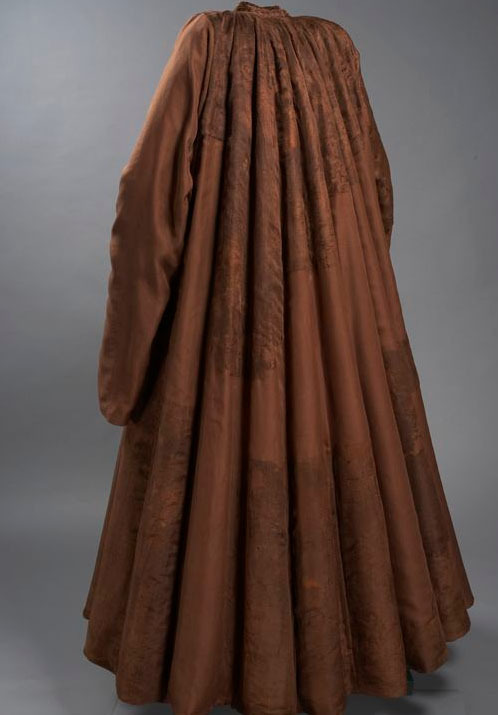 The drape would be more even all around the garment this way and encourages the skirt to wave. A few more details I gleaned upon seeing this houppelande up close: the front opening and the long vertical seams are top-stitched in tiny running or stab stitches of silk thread. No doubt this is for the purpose of finishing seams on the inside using a run and fell method. While the garment was originally made from velvet, it’s very damaged and doesn’t bear much of a resemblance to anything we would recognize as velvet today. (19) The conservation report states that it may have at one point been black velvet, though it appears taupish-brown all these years later, with perhaps the slightest cast of yellow-green about it. The shoulders are somewhat narrow for a full-grown man, but John was reputedly a slim fellow, and was at most 5 feet and 6 or 7 inches (172–173 cm). Perhaps his somewhat small frame extended to his shoulders. I saw many other clothing fragments at this bountiful exhibit, but these were the highlights for me. My only regret is that photography was not allowed. I would have taken far more photos, had it been, and I could have perhaps reported more. Bravermanová, Milena. Personal Communication. June 2016. Bravermanová, Milena, Petr Chotěbor [editors]. The Crown of the Kingdom. Prague: Prague Castle Administration, 2016. Crowfoot, Elisabeth, Frances Pritchard, and Kay Staniland. Textiles and Clothing c.1150–1450. Woodbridge: The Boydell Press, 2001. Fajt, Jiří. Charles IV—Emperor by the Grace of God: Culture and Art in the Reign of the Last of the Luxembourgs 1347–1437. Prague: Arthis, 2006. Royt, Jan. 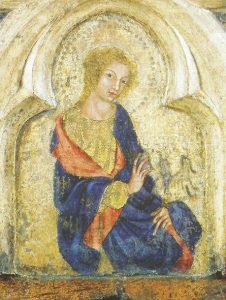 Medieval Painting in Bohemia. Prague: The Karolinum Press, 2003. Šroňková, Olga. Gothic Fashions in Women’s Dress. Prague: Artia, 1954. Voda, Petr. Personal Communication. June 2016. Hi, I don’t have anything specific to that time and location. I wish you the best in finding what you are looking for.